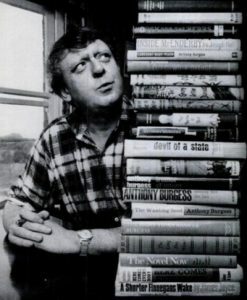 Anthony Burgess was no stranger to the book tour, and at various points in his career made himself available to his fans. Novelist Jonathan Lethem remembers meeting Burgess in 1985, the latter in rather a grumpy mood. Writing in the LA Review of Books, Lethem remembers the encounter as ‘charming and spellbinding and ghastly’. Burgess’s grumpiness could be better understood when looking at the schedule for book tours. For example, his 1989 tour for Any Old Iron consisted of a week of signings and interviews, starting at 9:30am and finishing at 7:00pm. Duties included: two full hours of signing copies of his novel for mail orders; a full day of radio interviews; further press interviews with Irish Times, Today, Woman’s Journal, Independent and more; an appearance on Terry Wogan’s chat show; visits to Bristol and Cardiff for signings at local bookshops; and several business meals and drinks with journalists and publishers. In this piece, written for an unknown publication in 1985, Burgess sheds more light on the publicity duties of the famous novelist.